Items from the Leo Cooper archive of military history publishing feature in a new display at the University of Reading Library. Leo Cooper, who died at the age of 79 in November 2013, gave his archive to the University and the collection of business, editorial and artwork files for his firm can now be consulted in the Reading Room at Special Collections. In 1968, after thirteen years working for publishing houses Longmans, Andre Deutsch, and Hamish Hamilton, Leo Cooper established his own publishing business, Leo Cooper Ltd. Cooper had already established the Famous Regiments Series with Hamilton and he took this with him to start the new firm. Over the years the Leo Cooper imprint published hundreds of military themed books with titles that include Gunners, game and gardens, Hunters from the sky and Red spy at night. The imprint specialised in publishing regimental histories and memoirs of soliders, many recounting their experiences of the Second World War. 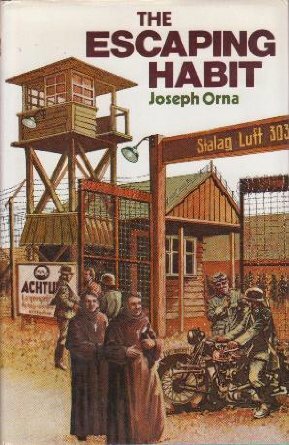 Spy stories are amongst these and include The escaping habit; the story of Joseph Orna’s escape from a prisoner of war camp in Northern Italy followed by his 2000 mile journey to safety, dressed as a Benedictine monk. Leo Cooper’s proudest publishing achievement, he said, was the publication of A history of the British cavalry 1816-1919. 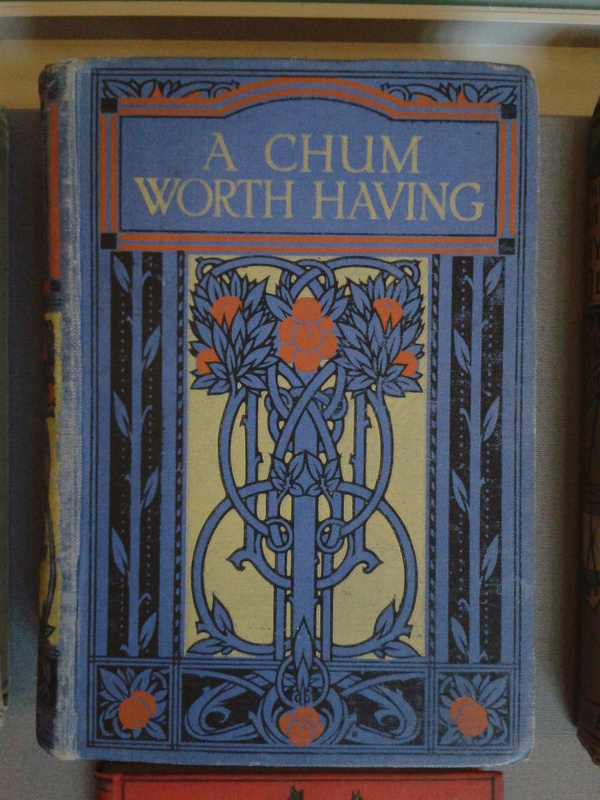 This was an eight volume series, published over 25 years and written by George Charles Henry Victor Paget, 7th Marquess of Anglesey, who, in correspondence with Cooper described the series as ‘my life’s work’. Twenty files of editorial correspondence, much between publisher and author, survive in the archive; these tell the story of the how the books came to be and how a friendship grew between Leo Cooper and the Marquess of Anglesey. 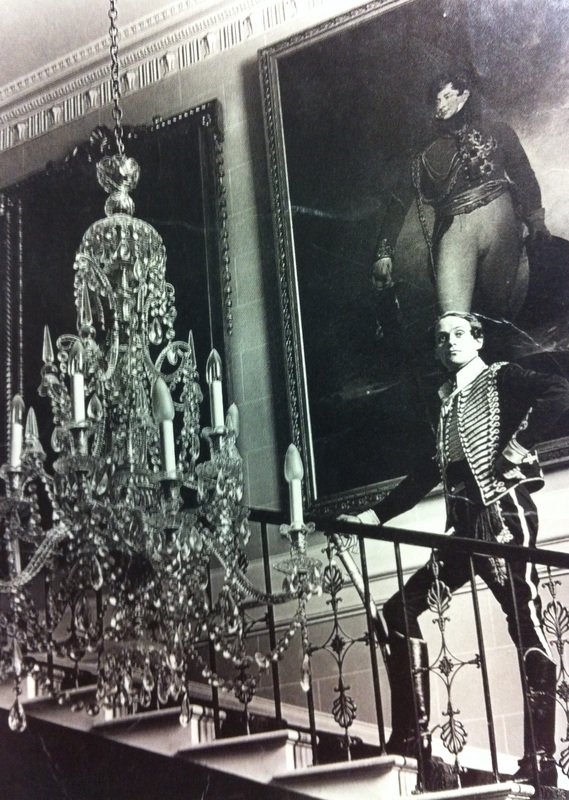 Below is is one of the many postcards, a photograph of himself taken in Wales in 1950, sent by the Marquess to Cooper declining an invitation. “Wasn’t I pretty in ’50? !” he writes. The display will be at the University library during February and March. As the world freezes over (well, part of it – Reading is recovering from floods, not frost! ), we thought it particularly appropriate to share the story of an intrepid (if tragic) explorer and his much loved biscuits. As early 20th-century explorers raced to reach the South Pole, they considered their supplies carefully; the right provisions could (and did) make the difference between life and a chilly death. Captain Scott set out in 1910, and part of his provisions included Huntley & Palmers biscuits – not just any biscuits, but specially made ones. Later arrivals at Cape Evans, where Scott began his last fateful journey, found several packing cases of Huntley & Palmers biscuits in remaining food stores. Records indicate that Scott initially set out with Digestive, Rich Tea, Petit Beurre, Fancy Lunch and Ginger Nuts biscuits among others (including fruit cake), as well as Emergency, Antarctic and Small Captain biscuits; later resupplies included digestives and Small Captains. Huntley & Palmers was not an unusual choice for Scott; by the turn of the century, their biscuits accounted for 75% of the total export of biscuits and cakes from the UK. Scott commissioned a special recipe from the company (now available on their website); although later research suggests that the team’s diet may have fallen short in nutrition, Scott believed the biscuits to be ideal. On 20 October 1911, Scott wrote to Huntley & Palmers: ‘Dear Sirs. After further full experience of the Antarctic and Emergency biscuits supplied by you to this Expedition I am of the opinion that no better biscuits could be made for travelling purposes. I consider that they especially meet the requirements of Polar work in their hardness, food value and palatability. Yours faithfully, R Scott’. Although Scott and the last of his men died in March 1912, they were not found until much later that year, and preparations were made back in the UK to send a selection of fruit cakes to supply the men when they returned; Huntley & Palmers themselves supplied a special Christmas cake for Scott. The biscuit and its fame live on, however. In 1999, a biscuit found next to Scott’s body was auctioned for nearly £4,000. 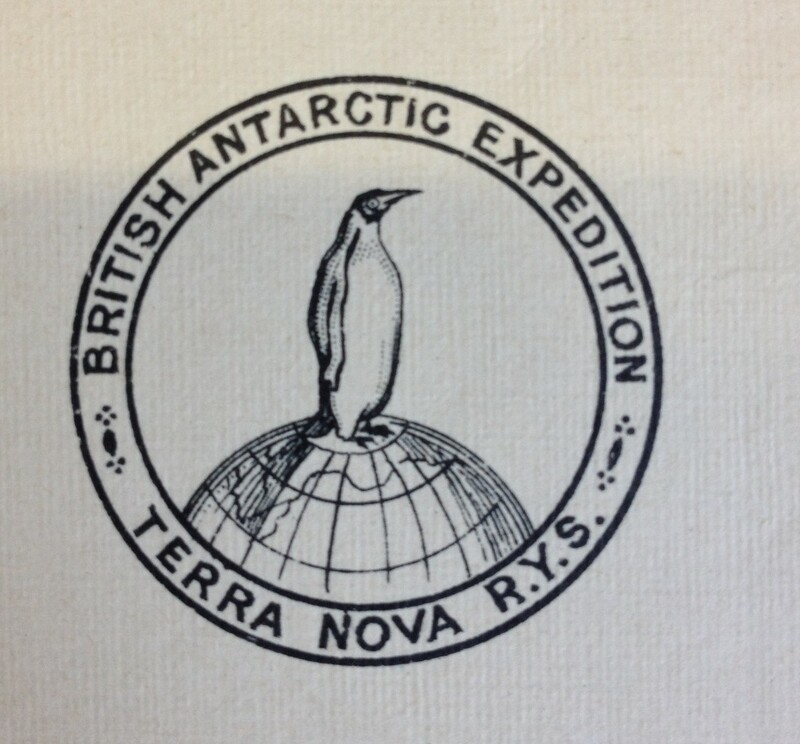 Purchaser Sir Ranulph Fiennes, who called it ‘the most expensive biscuit in the world’, passed the biscuit to the UK Antarctic Heritage Trust based in Cambridge. All seminars at 5pm in Humss Room 127. All welcome! For further information, contact Dr Nicola Wilson, Dr Sophie Heywood or Dr Alison Martin or see the Archives and Texts blog. Last summer volunteer Jenny Knight began work on the mammoth task of transcribing the indexes to the letter books of outgoing correspondence in the Chatto & Windus publisher’s archive. The early letter books are an invaluable source of information as loose files of correspondence were sent for salvage during the First World War and most pre-1915 letters written to the firm are gone forever. 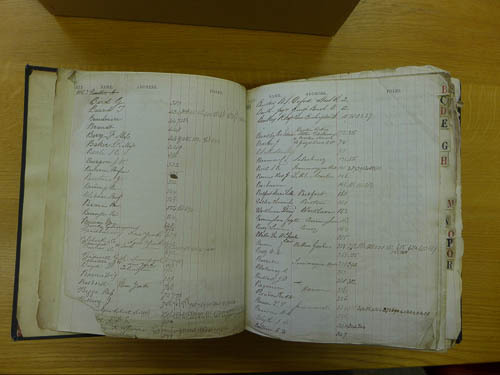 The index work that Jenny and other staff and volunteers are doing is enhancing our catalogue records, benefiting staff and researchers using our database. I was advised that the transcribing of the letter copies in the Chatto & Windus archive might be rather a dry and tedious business to volunteer to undertake. Slow, rather than tedious, might be true, but I have found it fascinating. 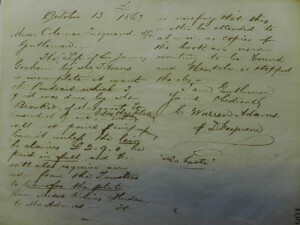 The task is simply to record the name of the recipient and then the page numbers of the corresponding letters which the publisher had sent to them. The letter copies are handwritten, of course, on fragile tissue which requires care when turning the pages. The writing is beautiful copperplate, which unfortunately is sometimes quite difficult to read, so I frequently have to locate the individual letters to clarify and confirm the name. More often than not, I need to read some of the text too. 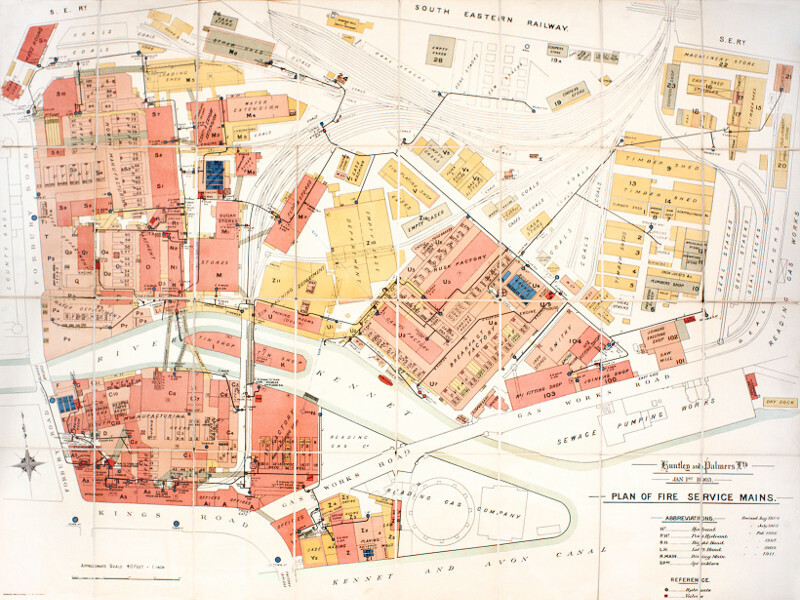 I am discovering a snapshot of business life in the 1860s which is tantalizing; there are no records of replies to any of the letters, so there is room for conjecture as to the outcomes of the incidents mentioned, and on the background histories of the people who were communicating. 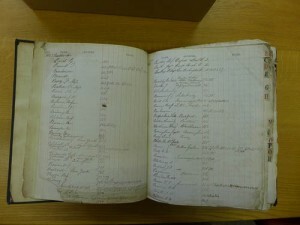 The first volume of letter records that I have been working on dates from the 1860s. The company was not called Chatto & Windus at that time; they were Saunders, Otley & Co. A couple of unexpected features (at least to me) are emerging. Firstly there is the international nature of the business, even as early as 1862. Letters were being sent to correspondents in America, particularly New York, to Australia and across Europe. In Europe there are a series of letters to Vienna and Paris – most intriguing are the letters to Versailles, where it seems a person at the very highest level of the French aristocracy was writing on dog breeding! Secondly, it has become a cliché that women who made a living by writing were considered shocking and unacceptable in Victorian England; everyone remembers that the Brontes initially wrote under male pseudonyms. Yet here are numerous letters to and from potential and accepted women authors, all under their own names and with no suggestion that they should publish incognito. They are most certainly not in the majority, yet here they are, confounding expectations, and addressed with flowery Victorian politeness. A Miss Emily Thompson was advised that her novel “The Staff Surgeon” was not selling well. By February 1867 it had “not quite cleared expenses”. Poor Emily. I noted one instance, however, when the wife of a “Reverend”, i.e. a minister of the church, had items published. 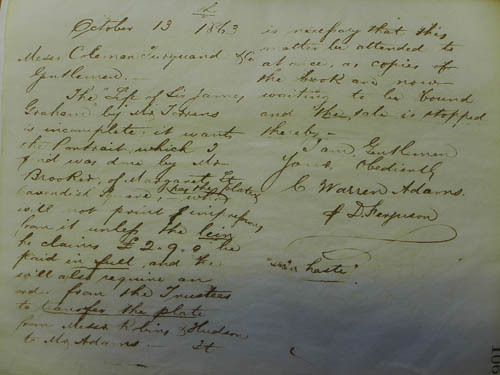 From the wording of a later letter in the sequence, it appears that a remuneration cheque was sent “care of” her husband, the minister, rather than directly to the lady herself. The details of the transaction cannot be known – but what a fascinating glimpse into the economic situation of women at the time. Business practice in publishing seems to have changed little in the past hundred and fifty years. On a daily basis, potential authors are requested to amend and edit their texts, are advised that their manuscripts have not been considered suitable for publication, or that their book sales have been uneconomic and copies are being ”remaindered”. The luckier, more successful authors are sent payment. Debts are pursued with brisk and determined persistence. Lunches are arranged with colleagues in the trade. Here, too, is a mention of another company in publishing which was to become a household name – Saunders, Otley & Co were corresponding with W H Smith on a variety of topics; the relationship does not appear to have been without problems! Most amusingly, advertising accounts are paid in postage stamps, sent to local newspapers all over the country. What would modern publishers give for advertising accounts of 6 shillings (30p) to the Sheffield Times, 8 shillings (40p) to the Stockport Advertiser, or the highest sum of 10 shillings (50p) to The Scotsman? – I’m sure even the modern adjustment of these costs would still be very small to those in charge of 21st century advertising budgets! 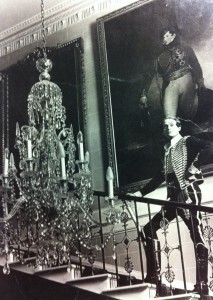 For more information, see our introduction to the Huntley & Palmers archive. A recent update to our Enterprise catalogue, means that there are some continuing compatibility issues with older versions of Internet Explorer. If you’re having issues viewing Enterprise in IE, we recommend for the moment that you use a different browser, such as Google Chrome or Firefox. Please do feel free to contact us or see a member of staff if you need help finding or ordering material. Alternatively, you can adjust the compatibility settings in Internet Explorer; see this Windows Support article for directions. Special Collections has recently acquired three books that provide a Reading connection to Ireland’s early 20th-century troubles. The Enemies of the State project, a collaboration between the Department of English Literature at the University of Reading and Berkshire Record Office, ran in 2012 to engage audiences with archives on the internment of Irish patriots in Reading Prison following the 1916 Easter Uprising. These Irish prisoners were listed in the prison’s register under ‘Aliens and Irish’ and joined other foreign nationals held in the prison. Part of the project included a small display of material related to the prison and prisoners, including three books – two by Terence MacSwiney (Principles of Freedom and The Revolutionist) and one by Darrell Figgis (A Chronicle of Jails). These have now made their way to us here so that they can be available to researchers. Terence MacSwiney was born on 28 March 1879 in Cork. He cultivated an interest in literature and Irish language and nationalism, founding the Celtic Literary Society, attending Gaelic League classes, setting up the Cork Dramatic Society and contributing to the republican paper Fianna Fáil (‘Soldiers of Destiny’) before its suppression. MacSwiney was a founding member of the Irish Volunteers, and he was arrested in 1916 and sent to Reading Prison. After eventual release he was elected to the Dáil Éireann for Sinn Féin and became Lord Mayor of Cork, but MacSwiney was arrested again in 1920 and died of hunger strike. He was widely mourned, and revolutionaries worldwide have claimed him among their influences. MacSwiney’s Principles of Freedom (1921), his posthumously published book of essays, sees him explore the difference between ‘propagandist’ literature and ‘art for art’s sake’. MacSwiney’s ideal Irish writer ‘will not be careless of form, but the passion that is in him will make simple words burn and live’. This copy belonged to one of Eithne MacSwiney, Terence’s sister, and includes a pasted insert that translates to, ‘Nothing becomes a person as much as giving his life up for his friends. Pray for all our soldiers – May God free the Republic’. His The Revolutionist: A Play in Five Acts is a first edition copy that appears to have belonged to and been used by the Abbey Theatre in Dublin. 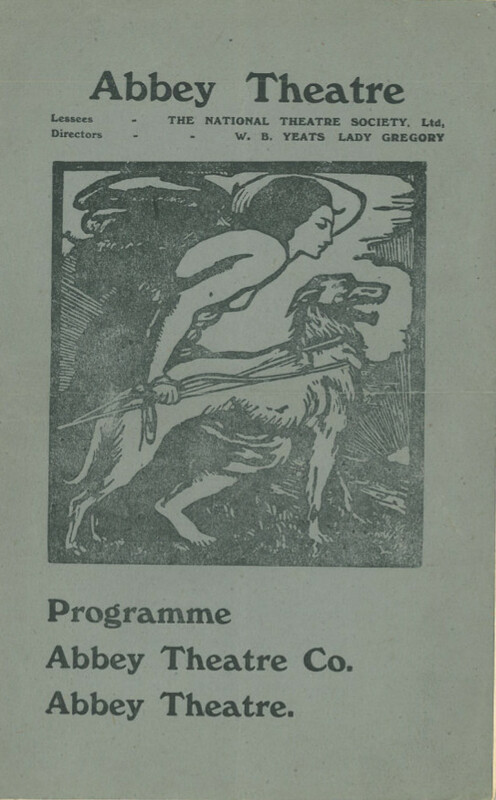 It came with a playbill for the original 1921 production directed by Yeats and Lady Gregory and includes annotations with stage directions and script notes. Darrell Figgis was born in Dublin but lived in India until moving to London to continue the family business as a young adult. He worked for the publisher Dent for some time, but moved to Achill Island in 1913, where he became a part of the Irish Revival. Figgis joined the Irish Volunteers and became involved in arms supply to the Volunteers, resulting in his arrest and eventual internment in Reading. Figgis’s A Chronicle of Jails details his time spent in the prison in Reading. He talks about the prison (‘the gaol is a handsome building, erected in red brick after the manner of an old castle’) and his conditions; Figgis learned what he could about law in order to lobby for better prison conditions. Figgis went on to play a prominent part of Irish politics up to the 1920s, but committed suicide in 1925. To celebrate the new year we have a vibrant new exhibition in our staircase hall. The exhibition celebrates the wide variety of beautiful book jackets within our collections, through a selection of our most colourful favourites! These examples are mainly drawn from our Children’s collection, Printing collection, Finzi collection and William St Clair collection. There are also a couple of stars from other collections – one of my particular favourites is the Tallis’s history and description of the Crystal palace, and the Exhibition of the world’s industry in 1851 (John Tallis, 1852) which features the publisher’s original deep blue cloth binding, with gold edgings and extensive gilt decoration. (Displayed in the upright cabinet, top right, seen below). 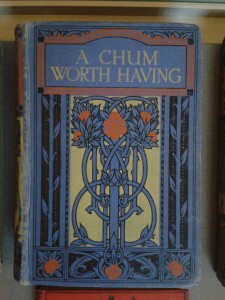 Particularly well represented are nineteenth century cloth bindings and twentieth century book jackets. 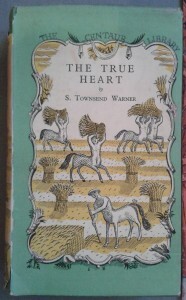 These include A Chum Worth Having published by Blackie and Son and The True Heart by Sylvia Warner (1929) with a dust jacket illustrated by Edward Bawden. 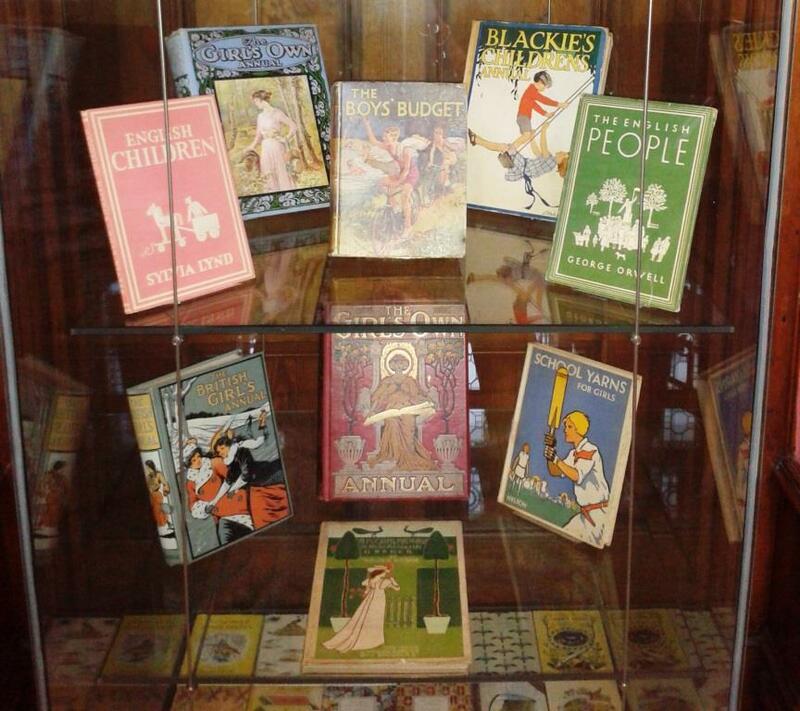 The upright case features a selection of delightfully designed twentieth century children’s annuals, such as School Yarns for Girls and The Boy’s Budget, serving as a wonderful, nostalgic insight into childhoods gone by. 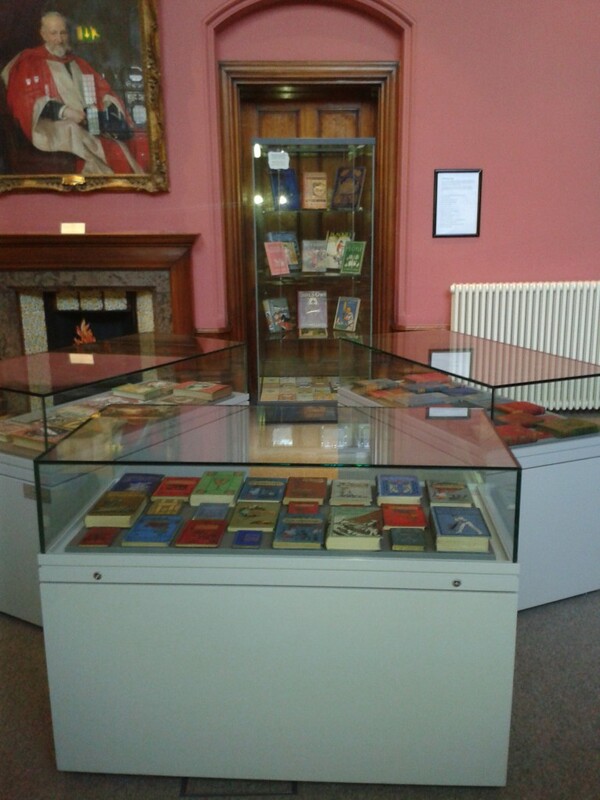 The bottom level of the cabinet is carpeted with a selection of King Penguin books from our printing collection. 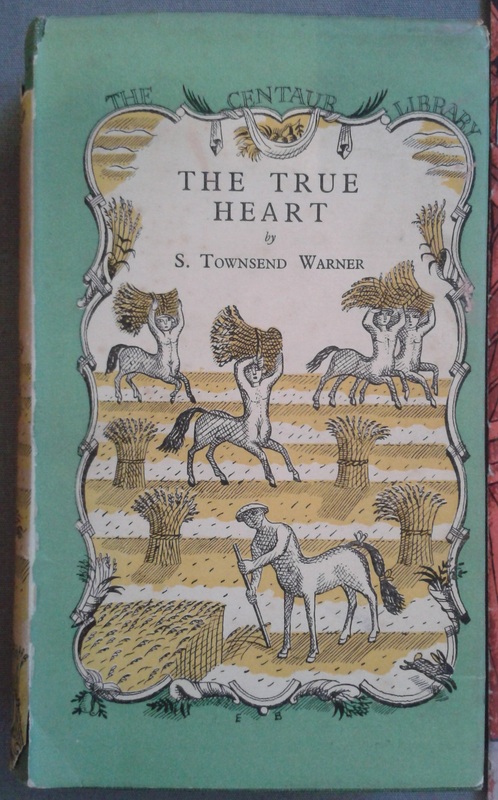 Published between 1939 and 1959 the titles in this individually illustrated series were the first books with hard and colour printed covers published by Penguin. Similarly, two titles from our collection of the Britain in Pictures series are displayed (Orwell’s The English People and Lynd’s English Children). With their strikingly coloured book jackets, this series was published by Harper Collins between 1941-1949 with the intention of producing morale boosting social histories whilst Britain was gripped by WW2. 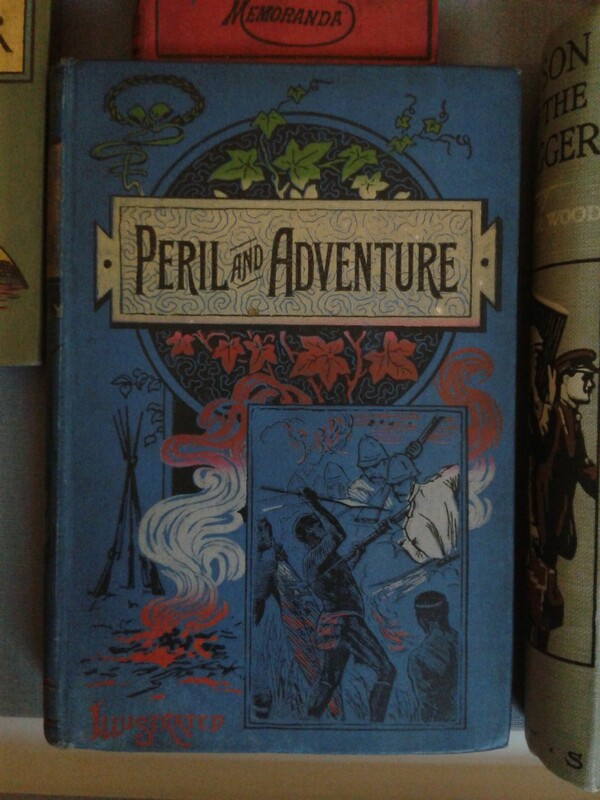 So why not come and visit us and pick your favourite cover, in my opinion Peril and Adventure will take some beating! Welcome back! We start the new year with some exciting news for our Beckett scholars. Emeritus Professor Jim Knowlson was awarded an OBE in the New Year’s Honours List for services to literary scholarship. Jim is the world’s leading expert on the Nobel-prize winning novelist and playwright Samuel Beckett and the founder of Reading’s Beckett International Foundation. He is instrumental in the work of the Beckett Archive and Beckett’s only authorised biographer. Vice-Chancellor Sir David Bell said: “Jim Knowlson has had an eminent career, devoted to scholarship of European theatre and the work of his great friend Samuel Beckett. He has been tireless in building the Beckett Archive into the richest collection of material in the world on the literary giant. And he has been in instrumental in making the Beckett International Foundation into a globally-renowned research body.